Imaged by Phil Thomson at Swan Bay, near Queenscliff in Victoria, Australia. Top: Images were taken a few minutes after sunrise. Each end of the reddened primary is doubled. 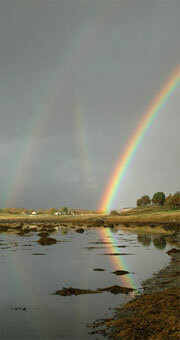 The doubled bows meet at the horizon and separate upwards and downwards. Image enhancement shows the secondary also doubled. Below: Forty minutes later, doubled bows form a cross. The centre of a rainbow is always directly opposite the sun and therefore below the horizon. Now imagine a low sun reflected by the mirror-like surface of a smooth lake or sea. In effect, there are then two suns and these can form two sets of rainbows. Rays from the reflected sun travel upwards and form rainbows whose centre is above the horizon. The rainbows from the two suns cross at the horizon. The rainbows below the horizon are produced by more contorted ray paths. Sunlight from the raindrops reflects from the water (reflected bow) or is reflected before and after it reaches a raindrop (reflected-reflection bow). The ray paths are perhaps easier to remember than their names!